Cupcakes 'n Daisies: Dresden Doilies Update . . . . I tried using a simple embroidery hoop for appliquéing my dresden blocks to my top and it's working out great. I'm careful not to stretch the fabric and blocks already appliquéd, and only leave the hoop on while I'm stitching, not hours on end or overnight. The center blocks will be the hardest I think because they have the most bulk around them. I have to admit that each block is getting easier, all I needed was something I could hold on to. I plan to add one border at a time, appliqué the blocks, then go on to the next border, again, to cut down on the bulk. Right now I'm thinking this project won't be a UFO for long. Just in case you've forgotten, the pattern is Dresden Doilies by Gerri Robinson and was in the September/October 2011 issue of McCall's Quilting. Besides working on this hand project I've been thinking about what I want to work on this year. I'm going through patterns and pattern books coming up with my list. I like to have some sort of plan in place, even if it changes as the year progresses, because you know what they say, "a goal without a plan is just a wish"! I hope to share my action plan with you later this week. I'm also piecing quilt backs and binding and getting some quilts out the door to quilters. So there's some quilting activity going on at my house, just not much to show for it, or nothing you would enjoy seeing, right now! These Dredsen Plates are looking good Thelma and won't be long before this is a finish. Nice to see these together and love the colors. I am in love with your dresden doilies. I have a thought for you. Have you ever seen or tried the hoops that sit on your lap. They have a smaller hoop on top and larger hoop on bottom with maybe 8 inches or so in between....they are made for embroidery. Or the larger lap hoops for quilting? If you use one of those it may eliminate the bulk issue. Just a thought. soardkgatfusedotnet I could send you pix of mine if it would help. Just fabulous! Thanks for sharing! there is a lot of motion in your dresden quilt - and it is gonna be awesome!!! So, so pretty! I'm glad you found a method that worked for you to keep going! Red is such a great background color in this quilt. You are making great progress ! So gorgeous ! Dresden blocks are way about my skill level Thelma but I do love the look. This quilt is going to be beautiful...I love the red background. 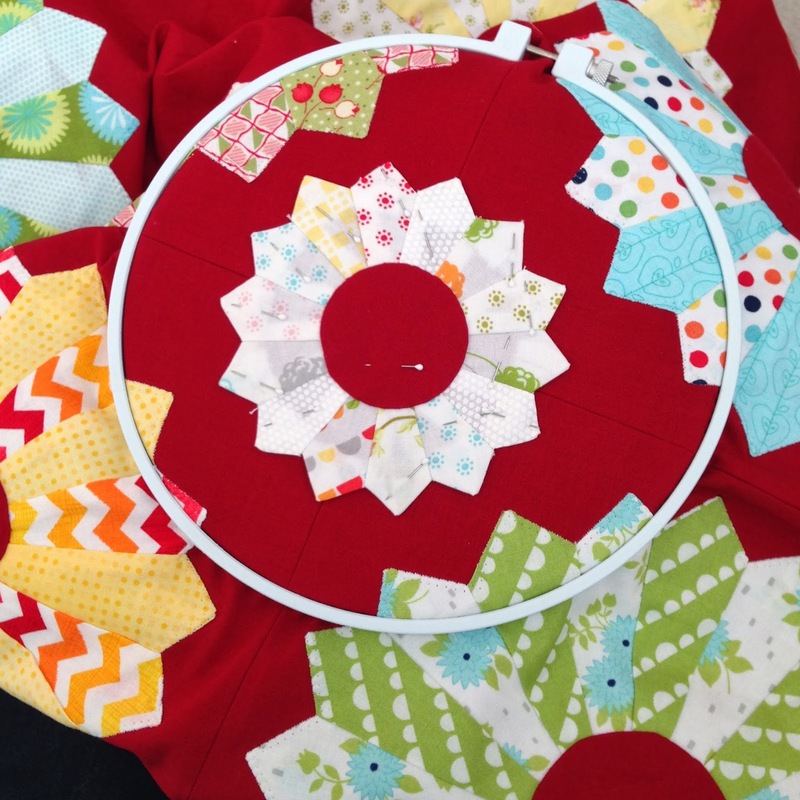 What a gorgeous quilt you are making! Love it! This is going to be such a pretty quilt! The hoop is a great idea. I was wondering how stitching those would work out! Another beautiful quilt on its way to the finish line! When I pop in and see this quilt, it makes me smile! Perhaps it might go in you header for 2014? I love seeing it! I love what you are doing with this. The red background it wonderful on this quilt. Thanks for sharing what works for you.